Did we mention we were tired? A really good summer sees us complete 120 dives. That's always our goal. Yesterday was our 121st and we have four, maybe five to go. Aside from a token swell that greeted us when we first arrived, the ocean has been calm and flat. Truly pacific. It's doubtful we'll ever see another summer like this. If we did, it's even more doubtful our legs could survive it. Yesterday was our 121st dive and we have four, maybe five to go. For several summers now, we've noticed comings and goings in mid-summer and then again at summer's end. It's happened again. We are now wondering whether this coincides with the full moon and the rip-roaring currents the earth's closest neighbour pulls along with it. In the last few days we've met some new turtles, but most rewarding, we've resighted several for the first time this season. Two are noteworthy because both are cherished friends, tagged females, and we resighted them on the same day: yesterday, 99/08/27. 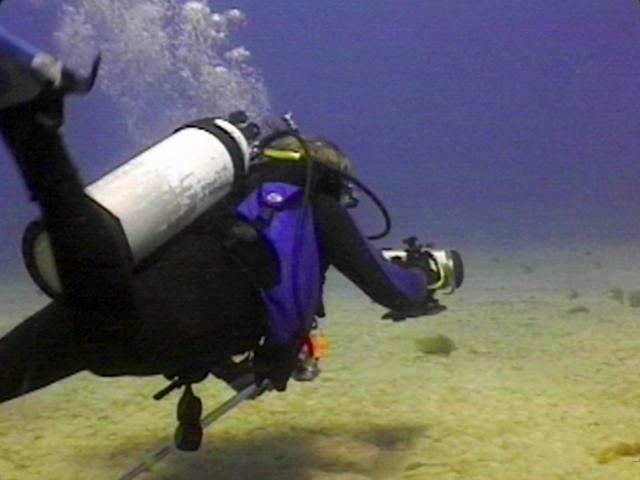 On our first dive, we were fighting one sucker of a current when we came upon a ridge. There, in the sand, rested a turtle. Ursula stayed back as Peter approached and videotaped. He didn't recognize her at first and so treated her as a new turtle, recording both left and right profiles. Then she tired of the attention, spread her flippers to leave, and Peter noticed she wore tags. He approached her to get a read. At this point, the turtle was up and then--those feet. Those unmistakeable feet! No need to read the tag, although Peter got a clear look at it anyway. It was Shredder, and Peter stopped to admire her as she calmly lifted for air. It was wonderful to see her again, but there is bad news. Shredder has a small tumor growing in each of her eyes. This wonderful old female now has fibropapilloma disease. Shredder has a small tumor growing in each of her eyes. 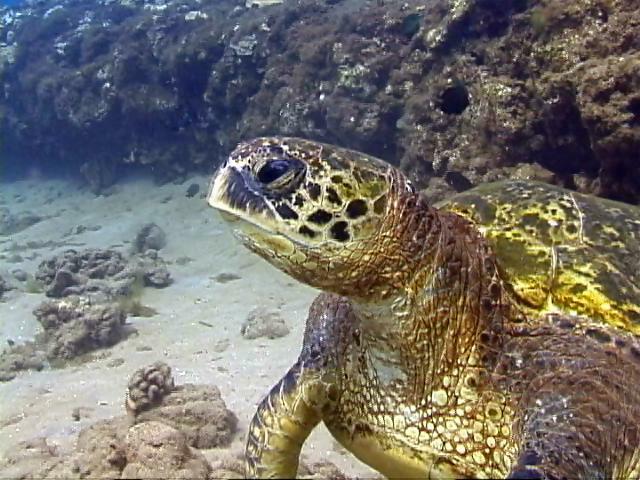 As if seeing Shredder wasn't reward enough, on our second dive we went to Reef 2, the other turtle hangout. Peter saw a badly tumored turtle and began videotaping. Ursula spied a shell resting in a crevice, white letter and numbers glinting in the afternoon sun. She approached, took one look at the turtle, and recognized Tutu. Delight was mixed with confusion. 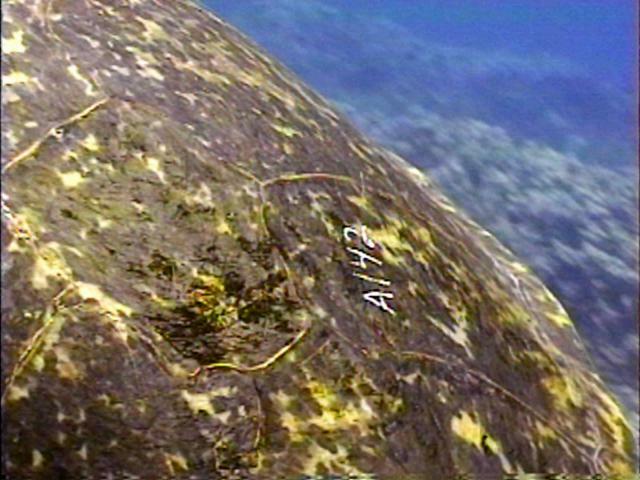 Throughout the summer we'd asked if she'd shown up at the French Frigate Shoals, where Hawaiian green sea turtles nest. We were told gently, no, but don't worry, she could have nested on one of the other islands and escaped notice. Yet here she was, big as life, with an A142 engraved neatly on her shell. Absolute testimony she's a this-season nester at East Island, French Frigate Shoals. We notified George Balazs, who informed us that she'd last been sighted, probably nesting, on June 23rd. The A142 was applied on June 8, the first time she'd been seen. Given the length of time between her last recorded sighting at the FFS and her appearance at Honokowai, we suspect that she might have nested at least one more time before heading home. Our last dive day is always special--although admittedly mostly sad. It's truly difficult to leave the honu and their world for another ten months. That's why our Aloha Dive day has always been a private thing shared just between us and the turtles. This summer will be different. George Balazs will be joining us as we say good-bye to the honu. 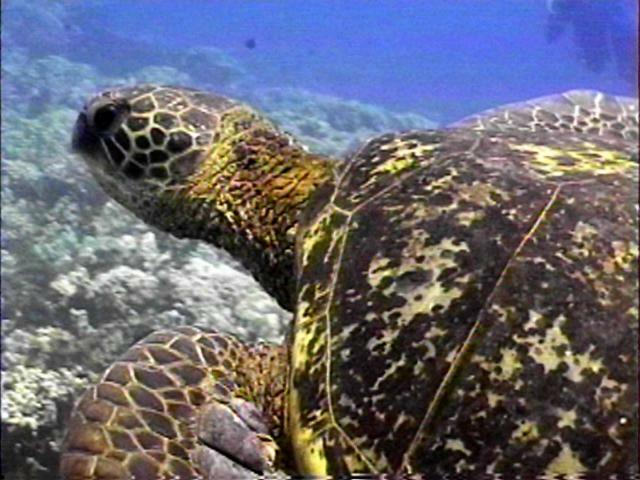 George is the honu's pioneer researcher. Put into perspective, if we were hanging about with a group of cool chimpanzees, it would be like we were spending our last day among them with Jane Goodall. We have an Aloha Dive ceremony that includes presenting flowers to the ocean and the honu: a kind of thank you, we love you, and we hope to return. Whether we'll be content to do our Aloha Dive with George, or whether we will feel compelled to dive one more time to say our good-byes privately, just honu and us, we don't know ourselves yet. Actually, it's a video freeze frame again. At North House, our new dive site, there's a large coral outcropping that we've named Mt. Balazs. 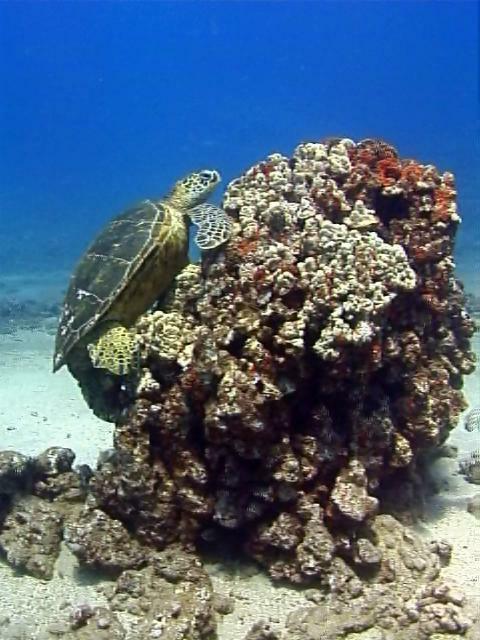 Throughout the summer we've seen as many as six honu resting under and around it. This, however, is the first time we've seen a turtle on it! This, however, is the first time we've seen a turtle on it!